Does your cat hide under the sofa each time the doorbell rings? Its hair bristles at the mere sight of another cat or a dog? Then one can consider that your cat is cowardly. Understanding what makes your cat scared is a way to dispel this disorder that can quickly become overbearing. Why is the cat afraid? If kittens are generally not suspicious of strangers, experience (and especially bad ones) sometimes makes the adult cat afraid. Cats identify their "friends" by smell. And for them, all those who have not caressed them, groomed them or those with whom they have not slept are strangers. They are therefore suspicious in their eyes. For example, a cat who is used to living with a woman may be afraid of a man, because his voice is more serious or because he has a beard. The same applies to children who move and express themselves differently from adults. And a cat that is scared can become aggressive when it does not have the opportunity to escape. It will certainly be less dangerous than a dog, but a claw strike is the least expected of things you would like your guest to experience. The most effective way to not have a timid cat at home is to socialize it when it is still a kitten. Between 2 and 7 weeks, it needs to be exposed to various stimuli of the outside world (make him meet strangers, change environment ...) while reassuring him. 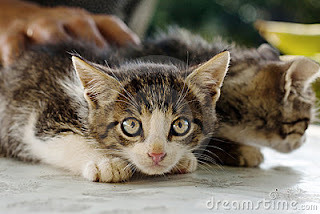 >>See also: How to Help Your Kitten Grow UP As a Sociable Cat? A cowardly cat needs hiding places, so offer shelters where he, and he alone, can go. To avoid him rushing under the sofa on the slightest opportunity, consider offering him a cat house made specially for him in a quiet corner. Play with your cat to act on his emotions. A toy like the fishing rod for example, keeps enough distance between you will ensure him. Give regular rewards to a fearful cat so that it associate a disruptive situation with a positive event. For example, when a guest rings at the door, give him a treat to associate guest arrival with food rather than stress. To build a good friendship with a cat, you should simple try make yourself a cat! The man is much bigger, noisy and imposing than the cat, which is why the latter gets sometimes cautious. Do not hesitate to lie yourself down, without a move while ignoring him and wait until he comes to you. When you have several felines, the encounters are sometimes explosive. Arrange several "withdrawal posts" in your home to avoid clashes. Two strategically placed cat trees in the room can do the job. The synthetic facial cat pheromones contained in the Feliway, once diffused in its environment, allow it to feel at home and safe. With some cats, the effects of the Feliway are stunning. On the other hand, in the most severe cases of anxiety, a consultation with the veterinarian will be necessary.